We all want to be Snoopy, fighting the Red Baron in our imaginations. And Classic Flights at Lake Wanaka, New Zealand, offers visitors a chance to step back in time and experience the excitement of early flying machines. I really love donning the old-style leather jackets and flying helmets, the white silk scarf streaming out behind you. There is something special about the smell of aviation fuel and wind in your face. The company flies vintage Tiger Moth biplanes on flights from Spitfire Lane at Wanaka Airport on the South Island of New Zealand. The friendly pilots offer 20 minute scenic flights over beautiful Lake Wanaka and Mt. Aspiring National Park in the Southern Alps. Braver lads and lasses can take the 30 minute barnstormer tour that includes many of the aerobatic skills of the bygone era. After this flight experience, aviation buffs must stop at the Omaka Aviation Heritage Centre in Marlborough. It’s like walking onto a movie set, thanks to the influence of famous movie director Sir Peter Jackson, who is chairman of the 14-18 Heritage Trust. 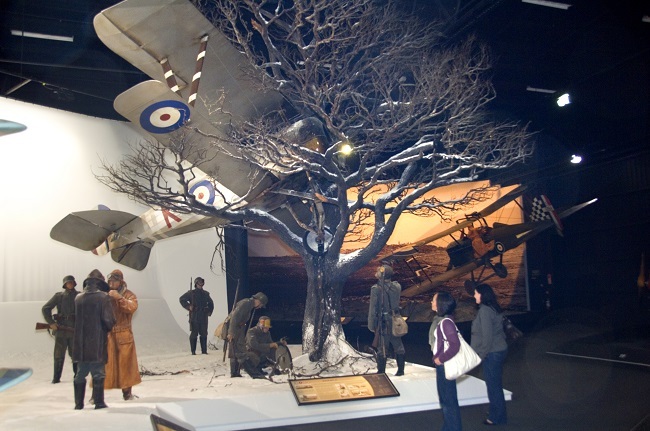 In the Knights of the Sky Great War Exhibition, famous biplanes are shown in scenes recreating many actual incidents, such as the last flight of Manfred von Richthofen on April 21, 1918. The Red Baron was fatally wounded while pursuing a Sopwith Camel at low level, just as another Camel was trying to attack from behind.